Rome’s greatest defeat came in the Battle of Teutoburg Forest, which I would rather label the Massacre or Ambush at Teutoburg Forest. To me, a battle results from a conscious decision on the part of two commanders to engage one another. There was no decision like that in this case because the Romans were not in a position to defend themselves. 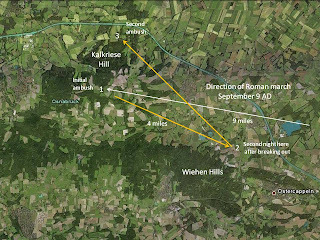 The attack took place in 9 A.D. against the legions XVII, XVIII, and XIX of Sextus Quinctilius Varus who had been commander of Germania since 7 A.D. Normally stationed near the Weser River, Varus heard of revolts around the Rhine so he traveled west to investigate. All three legions were wiped out, and when the seventy-two year Caesar Augustus was told of the debacle, he screamed for Varus to return his eagles. Part of the intrigue of the story centers around Arminius, son of the leader of the German tribe Cherusci, who was given to the Romans as a hostage in 11 B.C. He was raised in Rome, eventually being elevated to a Knight. Arminius (in Germany he's called Hermann) was assigned to the legions of Varus as a trusted advisor, but in secret he plotted with the German tribes to attack the Roman legions. Before we get to the massacre, we’ll need to talk about the Geography. 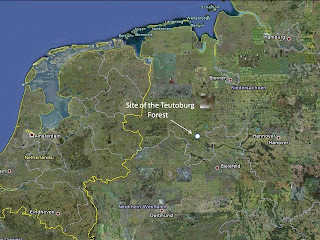 The following satellite view positions the Teutoburg forest in Northern Germany. It sits 130 miles east of Amsterdam, 70 miles west of Hannover, and 130 miles northeast of Cologne. View 2 below shows a close up of the main area of conflict. 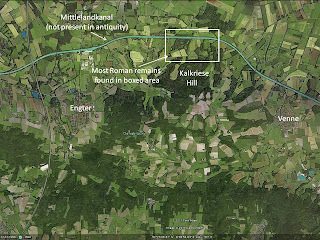 Key reference points include the cities of Engter and Venne, along with Kalkriese Hill, which was directly involved in the action. 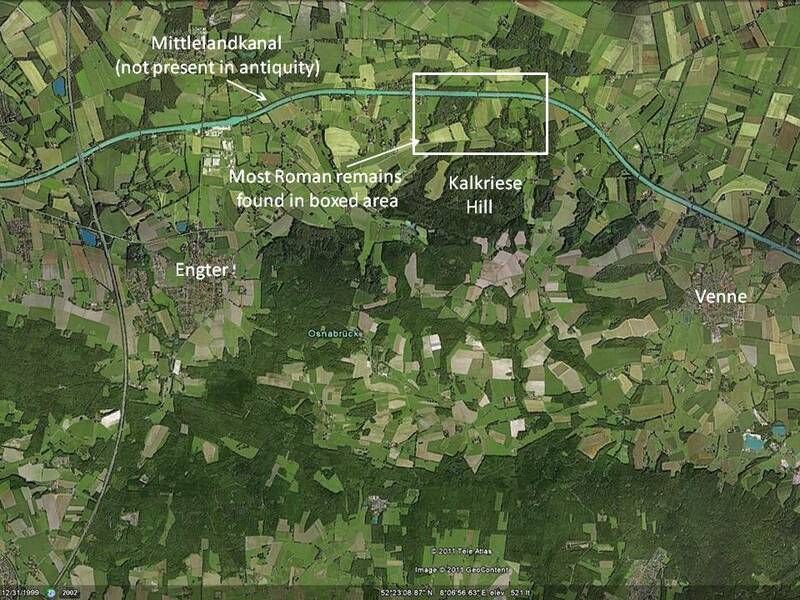 The majority of excavated Roman remains from the battle were found in the boxed area shown. View 3 is a closeup of the area north of Kalkriese Hill. 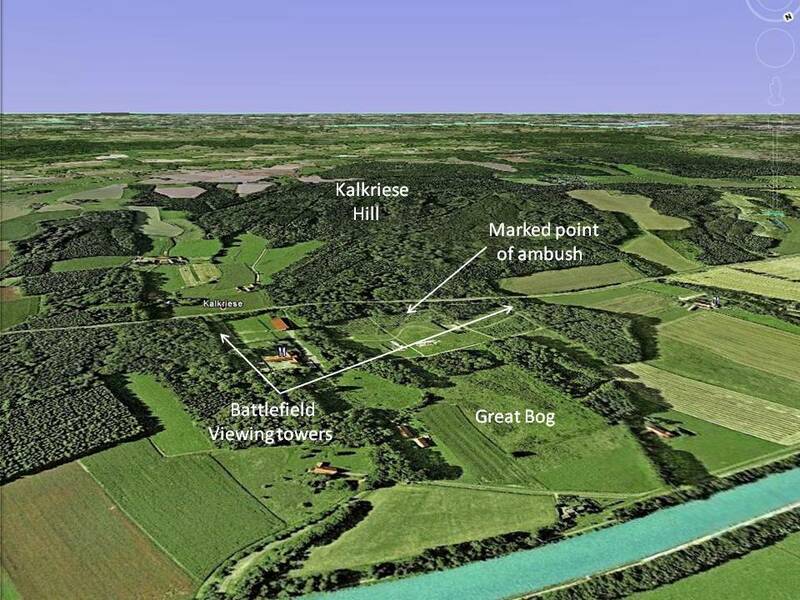 As noted in the photo, there are modern towers which allow visitors to survey the battlefield and there is one spot marked as the site of the ambush. There is also a museum there. One of the important things to notice in this view is the relationship between Kalkriese Hill and the Great Bog. The Roman Army became trapped in the narrow corridor (estimated at 200 yards wide) between the hill and the bog. This proved to be a tactical advantage for the Germans. To make the trap complete, they dug a trench in the road so the Roman Army was blocked from three sides. Lastly, we have view 4 which depicts the movements of the Roman Army during the battle. I want to emphasize that my description of the course of the battle is based on the documents I reviewed and is, by necessity, conjectural. The antiquarian writers, most notably Dio, cannot be trusted. Descriptive data is sparse and the writers have agendas so one does not know where the truth lies. Lack of details does not change the major facts of the battle or its significance, however. 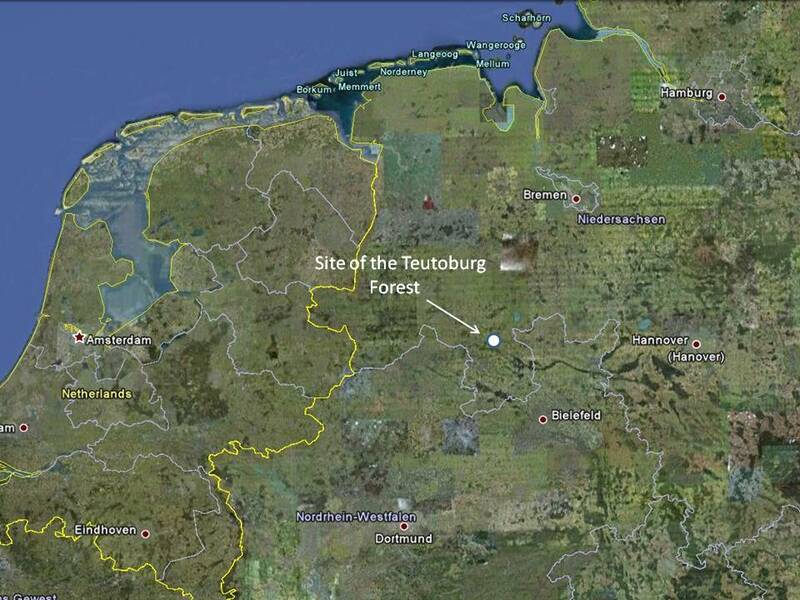 The battle opened with the Roman Army marching west into the Teutoburg Forest. Descriptions have the Roman force stretched out as much as nine miles in a narrow column. This seems logical since axe men would have been cutting down trees and the resulting roadway would have been narrow. When the army reached a point northeast of Osnabruck they were ambushed. Dio says that Arminius asked to be excused to check on auxiliaries but instead met up with the Germans to set up the attack. The Romans were ambushed at 1, in the midst of a heavy rainstorm, and lost scores of men because they could not deploy adequately against the German archers. By the end of the first day, they had regained their footing and built a fortified camp where they spent the first night. Assailed again in the morning they were able to break out to the southeast and reached 2, a point north of the Wiehen Hills and northwest of Ostercappeln. It’s unclear whether they spent the night there, but that is a possibility. The next day the army resumed its trek to the northwest, still in heavy rain, arriving at 3, an area north of the Kalkriese Hill, where the final massacre took place. Trapped in the narrow corridor between the Kalkriese Hill and the Great Bog, the rest of the army was destroyed. Three legions were wiped out with an equivalent number of auxiliaries totaling some 20,000. Most of the Roman commanders including Varus committed suicide once they realized there was no escape. From a tactical standpoint there is no way the Roman Army could have survived this “perfect storm” of tactical obstacles. To reiterate. 4) double crossed by allies who could communicate vital intelligence to the enemy. Would Caesar have survived this? 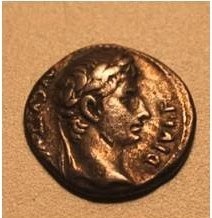 Varus was criticized as being more of a politician than a military leader but he must have had many good men under him. At the time of his death, he would have been the forth ranked man in Rome after Augustus, Tiberius, and Germanicus. Footnotes -- The legion numbers 17-19 were never used again by the Roman Army because of the ill luck and disgrace of Varus' men. Two of the eagles were recovered in 15-16 A.D, while the third was not retrieved until 42 A.D. Excellent post, very interesting indeed. 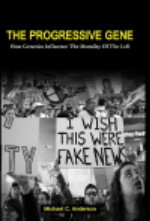 Great post Mike and thanks to Paul for pointing us to your excellent blog. I had no idea that the Romans managed to survive the first ambush and actually build a fortified camp. Its a bit of a mystery as to why they tried to resume their march Northwest instead of retreating back the way they came, unless, of course, the way was blocked by the Germans. Pity there aren't any decent ancient records of what happened. I´ve visited the site a couple of time...to be honest it hasn´t the feel of a battleground and the topography, even taking into account of the changes since, doesn´t strike me as an ambush site. There is a lot of controversy about this site...the coinage found etc and that osnabruck gets a lot of european money (10 million euros a year)due to it being there. Several other Universities (hamburg /sachsen) have produced papers making osnabrucks claims seem very doubtfull. Wether this was 100% the site of the battle is still not 100% proven...the archeological finds are to say the least...minimal. As docsmith mentions there are a lot of unanswered questions, perticually thoses where the logic of the romans actions is very questionable. One thing that would really help in the siting of the battle would be the finding of Aliso...find that and then if this site lies between it and Xanten /Haltern...then just maybe. The terrain?, it would hardly of been a hinderance to the roman army...they were trained to move fluidly, making a break in thier lines to swallow up obstacles like trees etc and effectivly overcome them. Even in small tactical units they could fight effectively...the command structure allowed this. The one real doubt in my mind is the numbers involved. Roman legions typically left anything up to a third of thier people in a secure base,by secure this would have been within friendly territory, ie over the border. This would reduce the numbers to 12,000 plus baggage. Even then this is a formidable fighting force...especially considering the legions involved...all veterans. This leads me to assume that the roman numbers at the actual battle were much smaller, legion strength maybe and that subsequent actions mopped up the legions at haltern, Aliso and other unmentioned smaller bases. This would then allow the forces available to the locals (given the population density problem) to concentrate a much more overwhelming (although not the 10000 plus necessary)force to deal with much smaller bundles of romans. I have met Sir T.Clunn, and on asking him as to wether he was definately sure about the site being the battlefield seeing as there was a paltry amount of physical evidence connected to such a large battle...he was uncertain in his answer. A nice article, an excellent blog and thanks to Paul for linking it from his blog. PS...I´d love to discuss this a lot more. If you want I can find the other university reports questioning the viability of the version that osnabruck gives. Some good points there Paul. I tend to put the defeat down to the poor leadership from the top, rather than the tactics used by the army. I would also suggest the area was more wooded back then and this was an area that the Romans did not know about, which must have added to their woes. The terrain may have been a factor..but then again not. The romans fought over more difficult terrain when fighting the dacians. Ok...they had a hard time in Dacia...but after a while they suceeded..in similar fashion to the swamping of the german interior by germanicus. The leadership....also could have been a contributing factor but this problem had also been "ironed" out after the marian reforms...the individual units were more independant of action and tactics. The centurions would have quickly (being veterans) realised what was happening and taken local control..wether in groups of centuries or cohorts etc. It was after all thier function in the legion..along with the legates. I still think that the number of 18000 is very disputable....that is one massive force...3 complete legions!!!! It would have taken not only stupid commanders and dreadfull terrain but a massive amount of locals to have overrun that. After the initial shock..which may have lasted but an hour or so, the romans would have re-organised and gone on the offensive...the sheer amount of people available to them would have allowed it. If...the locals had of kept up a sustained attack..not allowing the element of shock and awe to subside they would have needed many many 1000´s more than the romans (local population density!?) to achieve this. My reasoning here is the 20min to 30 min fight rule. After 20 mins of hand to hand fighting anyone becomes tired from a mixture of physical exertion and fear. They would have had to be "swopped" out...a tactic the romans used constantly. Ok..the locals my have learnt this (arminius) but they would then need reserves...many 1000´s of reserves to attack 18000 romans. Not only that...attackers need at least (even in a suprise attack) a superiority of 2 -1.. The sheer numbers necessary lead me to think that the roman forces were much smaller..scattered in bases/camps etc and the "main assualt" on varus and a couple of thousand happened over 3 days but the legions were wiped out piecmeal over a much longer period. ...aaand, sorry, didn't mean to be redundant about the subjective/objective at the end there, I was distracted and basically repeated myself... DOH! lol! I posted a sequel to the battle on July 9, 2011 called The Teutoburg Massacre - End Game which discusses how Rome viewed the defeat. That will help you. Spread out over 9 miles is not how Legionares are effective esp in a dense forest and swamps. They got stopped+stomped = FACT~!